PayWhirl Gift Codes are unique promo codes that your customers can purchase for friends and family and works like digital a gift card. This way they don't have to deal with having to set up a new account for the recipient and manage their payment information on an ongoing basis... We'll walk you through how to make a gift code form to embed into your website and what happens when a customer purchases a gift code for someone else. From your dashboard, click on the "Gift Codes" icon. First you'll enter the default Gift Code amount that will be suggested to customers as a starting point when they are purchasing a code for someone else. This will appear as the recommended amount in which to purchase the Gift Code, however, customers will be able to enter any amount they want when purchasing a gift code. 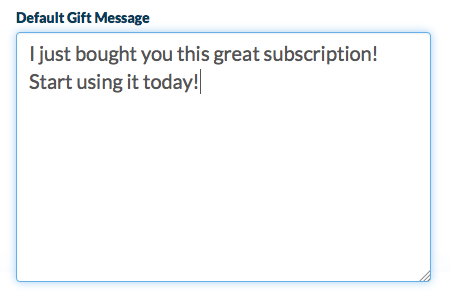 Next, enter a default gift message as an example for customers purchasing gift codes. The customer will have the option to change this when they purchase. Note: The default message will be sent to the gift recipient if the customer does not enter their own message. 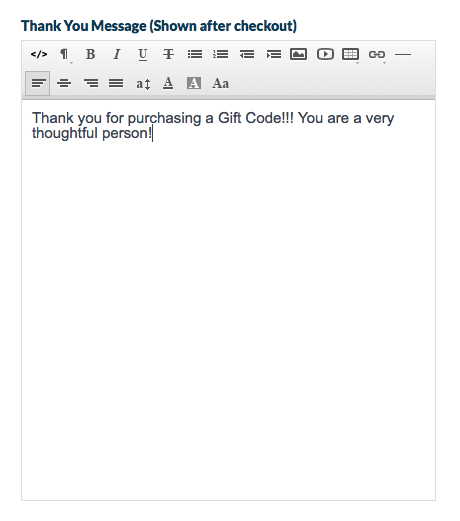 Then, enter a Thank You message that will be shown to the customer after they complete checkout for a gift code. Finally, don't forget to SAVE any changes to your gift code form at the bottom. After you save you will be given an embed code that you can copy/paste into your website so your customers can purchase gift codes others. Note: If a user applies a gift code to a subscription that costs less than its total amount, the remainder will be credited to their account. The remaining credit will be applied to future transactions before their card is debited.